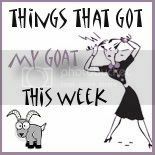 Veronica Armstrong-Archives-Things That Got My Goat This Week - Link Up! Things That Got My Goat This Week - Link Up! I don't blog about it enough but I am obsessed with every single version of TRH known to man. Seriously. If there was a Real Housewives of Poughkeepsie season I would watch it. It's phenomenal television. Fact. What has gotten my goat is that these freaking housewives have these horrible awful catchy songs that I cannot get out of my head. I've been singing LuAnne's "Money can't buy you class" for the last three days. My kids deserve better than that. This year's big hit is sure to be "Closet Freak" which Kandi wrote for Lawrence Washington on RHOAtlanta. Unfortunately Lawrence has an amazing voice which means that this (wonderful) song might surpass even "Tardy for the Party" in popularity. This is great for him. Awful for me. Grandma has videos of P singing "Closet Freak" to look forward to. I cannot find a video of the latest atrocity but seriously I have had it. HAD IT! As if the obnoxious "He went to Jared!" lines weren't annoying enough. Now they have a commercial showing a little girl drooling over some chocolate at a candy store. She grows up and starts drooling over some crappy Jared's chocolate diamonds. Yep the marketing people working for Jared have figured us all out ladies. We just L O V E nothing more than chocolate and diamonds. It is that simple to please a woman. Yes sir that is what each and every single woman wants for Christmas. Some brown poopy diamonds. Alright fine maybe most women DO like diamonds and chocolate but do the advertisers have to be such dicks about it? And if you were planning on buying me some chocolate diamonds don't let this half assed post stop you. I'll happily pawn those shits for something I DO need like a MacBook Air (hint for my husband). There is no explanation for this other than Gargamel's deviant behavior. How else to explain an app that is CLEARLY designed for children to play (Oh, what is that you say? My kids are too young? You caught me. I was playing Smurf Village. Mind your damn business buddy!) yet has sneaky in app purchase options hidden within it. One is given the option to disable the feature but I suspect that most people just skip right over the notification without giving it a second thought. You know how crazy smart I am ; ) and even I had a scare. My sister texted me freaking out thinking she had accidentally spent $140 on in app smurfberries. As I smugly laughed to myself I thought perhaps I should check my bank account before my laughter reached douchebag proportions. I quickly noticed $300 was missing. I FREAKED. I ran downstairs to my desktop computer and began an investigation. Long story short I found the $300 (a check had cleared) and breathed a sigh of relief that I wasn't going to have to explain to my husband that I spent $300 on virtual smurfberries. I know exactly what his reaction would have been. Half listening he would have responded with something like "$300 on smurfberries!?! Well when will they be here and what are you going to make with them?" Feel free to grab the button and please leave a comment after you link up. I cook. I clean. Never smell like onion rings. Me as a stay at home mom.